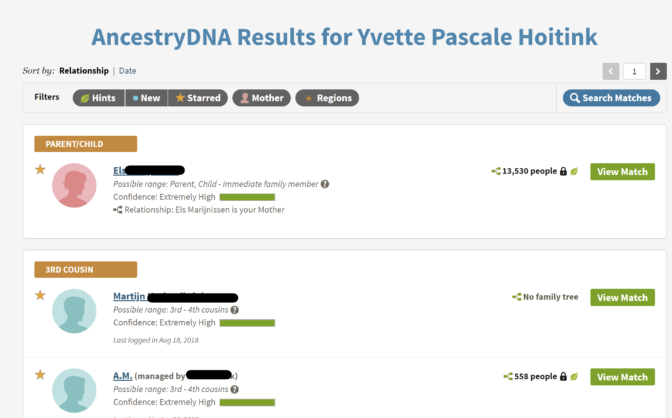 Ask Yvette – Should I Take a DNA Test? Last month, I blogged about my ethnicity predictions, which were wildly off. As a result, several people have asked me: Should I take a DNA test if they are so unreliable? You see, a DNA test gives you two types of results. On the one hand, it gives you the ethnicity predictions. This feature has the most curb appeal and is a reason why many people test. Unfortunately, these results are highly speculative, especially below the continent level. My ethnicity predictions varied from 94% Western European (close) to 88% British with a smidgin of Turkish and Italian (wait, what?). On the other hand, it gives you a list with matches; people you share DNA with. The more DNA you share, the closer the likely relationship. For genealogists, the real value of a DNA test is in these matches. You will always share DNA with second cousins or closer, but can also share DNA with more distant cousins. By working with your matches and comparing trees, you can verify your research and break through brick walls in your own tree. I have several matches that I can trace back to a common ancestor six to ten generations ago. To see what tests you should take to have the best chance of Dutch matches, see the article Dutch DNA Testing Strategy.